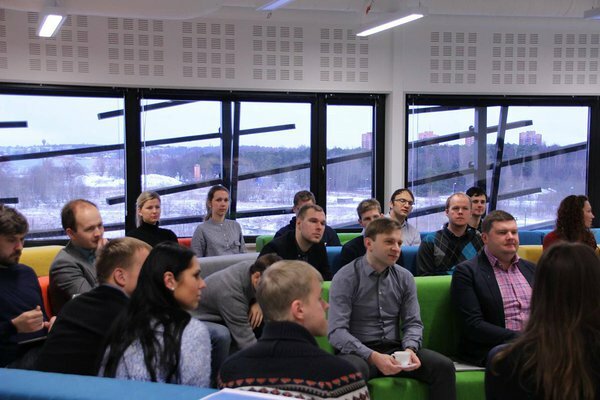 On the 5th of February, The Minister of Entrepreneurship Liisa Oviir and the startup community leaders and enthusiasts gathered to discuss the results of the Startup Compass report about Estonia. Startup Compass benchmarked Estonian startup ecosystem against Silicon Valley and the European average, while also giving highly valuable industry data to make sense of what’s going on in the Estonian startup ecosystem. While small, our startup ecosystem is growing very rapidly, building on the several success stories it has produced. The Compass also pointed out some shortcomings and areas for further development, such as the talent and funding gap, which were the main discussion points on Friday at Pipedrive. Firstly, the report estimates that there are about 500 - 700 startups in Estonia but not enough talent to reach the needs of growth. So, Estonian startups have to look outside of the country to find necessary talent. We have produced some great entrepreneurs and top talent but across skill sets stakeholders agree that the quantity is insufficient to meet the growing demand. In order to close that gap, better regulations for immigration must be part of the solution. The discussion at Pipedrive brought out that one of the problems why talented people can’t come and work in Estonian startups is that we don’t have a good support network for their families, such as a sufficient number of international schools or kindergartens where their children could study in English or where their spouses could work or volunteer. Furthermore, the problem is also that since many talented people are travelling quite frequently, it's not too realistic that they would learn Estonian, because they might stay here for only a few years and then move to another country. The Minister agreed that this problems needs a further discussion and collaboration with the Ministry of Education and Research. Tiit Paananen from Pipedrive brought out that other than that, Estonia is a great place to work and live because it’s extremely safe and clean here. The second concern involved e-residency. As it turned out, people who come to Estonia do not know what can or could be the next steps after getting an e-residency. Could they actually come to Estonia as well and how? Where to start with setting up their business? The system is not transparent for them which might lead to a negative experience. It seems that some sort of a “client management agency” or a system should be made to make the experience of e-residents more smooth and easy. The third point that concerned the startup community at Pipedrive last Friday was about the labour taxes that are relatively high in Estonia. It’s no longer possible to just pay a lower salary in return for compensating a startup employee with options, the wage has to be competitive. Liisa Oviir agreed that the taxes are too high but the solution for this problem has to be beneficial for both sides – for the government as well as for the startups. In order to find the solution, the minister encouraged the startup community to speak up more actively. “It could be the point of cooperation between Startup Estonia and the startup community to discuss and propose how we can go forward,” said minister Oviir. This kind of a meeting was hopefully the beginning of strong collaboration between the startup community and the Minister of Entrepreneurship. Startup Estonia has already been making progress by mapping the current state of the startup ecosystem in Estonia. You can get acquainted with the documented suggestions from the startup community over here and give your input as well.